Jared Unzipped: The Hunt Is Over. I Found Camo Wedding Rings! That's right! The hunt is O-V-E-R! You and your baby can finally come together in holy matrimony in the only way you know how -- under the luxurious protection of full camouflage! YEEEEEEEEEEEHAW! Folks, I've seen some weird crap in my time. But this? It takes the cake. I happened across this ad in my most recent Sunday newspaper. It was mixed in with the various coupon booklets and sales advertisements. Never in my time have I seen something so gloriously trashy, all the while completely hilarious. I'll break the ad down for you. 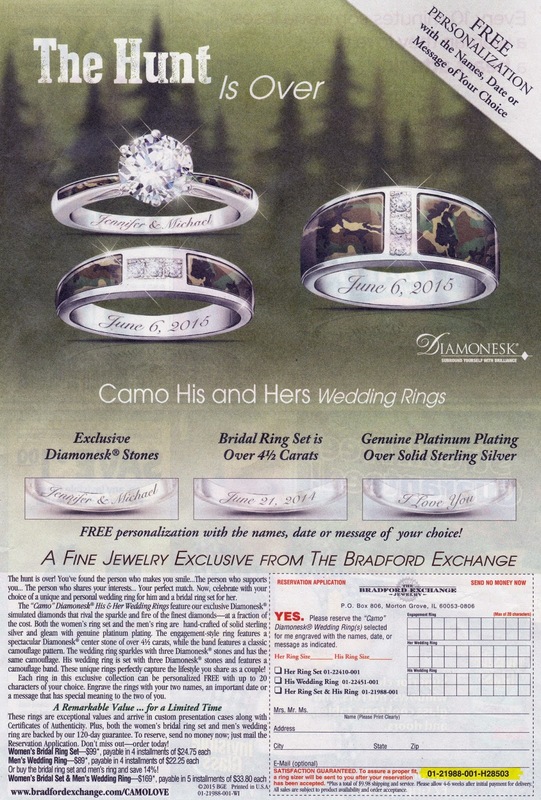 Up for sale is a Camo Diamonesk His & Her Wedding Ring set. As if having a camo couch, camo truck, camo bikini, camo underwear, camo dish set, camo lawn mower, camo bed sheets, camo soap dispenser, camo backpack, camo bowtie, camo shower tiles, camo pillows, camo plastic cups, camo phone cover, camo lingerie, camo kitchen countertops, camo baby pacifier, camo lawn chair, camo wallet, camo sunglasses, camo checkbook cover, camo cooking apron, camo car seat covers, camo press-on fingernails, camo umbrella, camo baby seat, camo pencils and camo mascara wasn't enough... you can now get your wedding rings in camo. I mean it makes perfect sense, right? Except when you drop your camo ring in the woods. How in the hell are you going to find it? The trashy absurdity doesn't end there. Let's analyze the sales pitch! Hmmm... these rings come with authentic Diamonesk simulated diamonds? Well now, they're probably worth the same as real diamonds (read my past article about diamonds here). Check out that classy platinum-plated sterling silver. It must be worth as much as two, maybe three of the knives in your kitchen silverware drawer! As a bonus, you can engrave up to twenty characters on the inside of the rings -- put your names, your wedding day or the date your hubby shot his best friend Dwayne by accident while recording a video for YouTube after downing a six pack of Old Milwaukee! You simply can not wait to purchase this ring set. This is an absolutely amazing deal that is too good to pass up. The entire set can be yours for only $169. But wait... if you can't afford to spend $169 for your wedding, then you can break it up into five equal installments of just $33.80! It's like lay-a-way for your wedding day! Golly, I just made a rhyme! Let's make one thing clear -- if you can't afford to plop down a meager $169 for wedding rings in one fell swoop, then you might ought to reconsider your life choices. 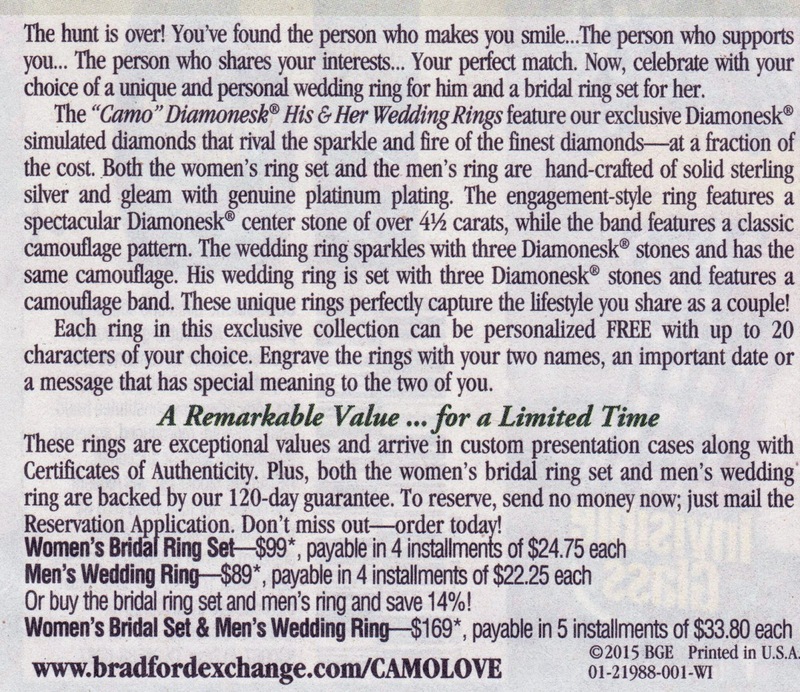 Obtaining some cheap camo wedding rings for you and your baby daddy might not be the smartest of choices. "These unique rings perfectly capture the lifestyle you share as a couple." Yep, a lifestyle of poverty, low standards, cheating on your man with the owner of the trailer park, leaving loaded weapons in your house, complaining about minorities using welfare while you yourself have an EBT card, and all around just being a worthless piece of trash. Congratulations! Little Baby Jesus would be so proud! I hope your extremely judgemental comments are only towards the ad, cause it would be rough living such a closed minded life. If you actually read and understood the entirety of this article, you'd comprehend that the comments went beyond the advertisement. No surprise there -- another ignorant American who doesn't read. If you've got something important to say, don't hide behind anonymity. Can't even get camo rings without some ignorant american judging you, god forbid there's a couple out there that likes camo. I'll end with only this; climb down off of your high-horse and get bent. I'll give you points for at least TRYING to use correct punctuation and grammar. Leave it to a dope to come to my blog and complain about my grammar, only to misspell the word as "grammer". Only in America! Worst article I ever read. Dude write a diary with your complaints no one cares about them on the internet, better yet try Tumblr. Might find more narrow minded people like you. For goodness sake do something with your life. Stop being so worried about other people's lives. So just because someone actually likes these as opposed to being ordinary it means they're trailer park trash? My fiance and myself are in the process of building a 7,000+ square foot home in addition to the 20+ other homes we own between the two of us, neither of us gets any form of welfare, or fit any of your other stereotypical, ignorant comments. We just choose not to be like everyone else. We could easily afford a more expensive set but fact is we work hard and don't see a lot of sense in spending a fortune on rings we'll destroy in a matter of months. (I lost a diamond AND broke the setting off a $2700 engagement ring). So before you decide to show your ignorance by bashing those who choose to buy them consider this...I'd rather spend several thousand on my honeymoon hunting in Canada and my home than spend it on a ring that will need replaced shortly. I agree with the other comments on here. I pray that the Lord places His Holy Spirit on your heart and you are filled with His peace. For some reason, you choose to bash other people, when you should be looking within to figure out why it is that you are so hateful. I pray you find God and change your way of thinking. God bless! Wow open your eyes and really see the goodness around you. Is that all by chance you think? The fact that the sun orbits at just the right distance not too hot or cold. The moon to keep the oceans in check. And somehow the "BIG BANG" theory created life and the reproductive organs, and millions of different creatures. I'm not betting my future on that. It's just as easy to to have faith in the Idea that there is a creator and life isn't an accident. I hope you can forgive those who tore you down as you try to pass on to others. I don't have a camo ring nor will I buy one I somehow saw your blog and felt led to leave my wisdom.